Flowers are a popular scrapbook page embellishment. In this gallery, look at flower design in a new way, perhaps as a graphic design element for your pages. The sketches in this gallery show you ideas for using very large flowers. Of course, these flowers can be printed in many sizes so that you can layer them, cut them out of a variety of materials, and add them to your pages in any size scrapbook. This sketch layers large flowers beneath a wavy strip of patterned paper or cardstock. The focal point photo is supported by three small pictures. To save these sketches to your computer, simply right-click the image and select "save as." Or to print the sketch, right click on the image, select "copy," then right click on a blank word processing document and select "paste." 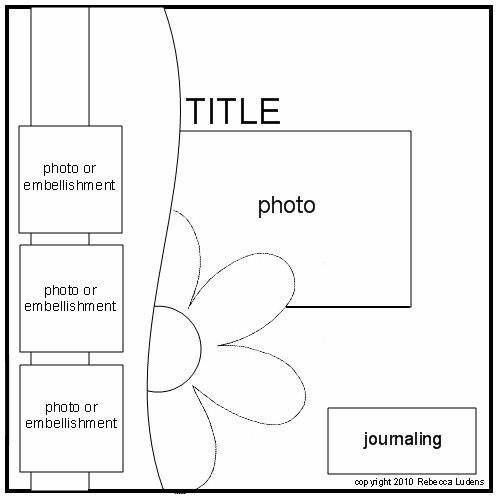 This sketch uses two modern-looking jumbo flowers on opposite corners of the scrapbook page. It has room for one focal point photo and one supporting picture. This scrapbook page sketch uses one extra large daisy in the upper left corner of the page, giving it a summery pop! The focal point photo is supported with three smaller pictures. This sketch of a large and modern flower with clean lines can easily become a graphic element on a scrapbook page layout design. Printing it on colorful or patterned paper makes for the creative element to mix and match on your scrapbook page. This flower has six classically rounded petals. Use the pattern in all different sizes to mix, match and stack them for added dimension to your scrapbooking page. You could make these in different sizes and stack them for even more dimension. To resize the flower, paste the image into a word-processing document. You can then resize the flower by left clicking on the image in the word processing document to select it and then dragging a corner to make it larger or smaller. This flower shape is the most intricate of the simple patterns. This fluffy daisy is fun by itself and would be amazing in layers of smaller daisies. Try resizing this flower for a lovely layered effect! The five rounded petals of this large flower sketch are fully separated, which means there's room for creativity! Once it's cut-out, try rolling the edges of each petal upwards if for added dimension. A variation of the modern flower on slide four, this flower has more petals on it, expanding its potential for dimension and adding a touch of flair. This simple yet full-petaled daisy sketch can be printed in various sizes, on different paper colors and patterns to embellish a thematic spring or summer scrapbook page. This fun, quirky flower with seven petals adds a touch of floral personality to a scrapbook's page. Similar to the other flower patterns, this flower can be printed in several different sizes to add variety and interest to the texture of a page.